Science and cooking marry to create perfect flavor pairings for 150 common ingredients in this stunner of a book. As an instructor at one of the world’s top culinary schools, James Briscione thought he knew how to mix and match ingredients. Then he met IBM Watson. Working with the supercomputer to turn big data into delicious recipes, Briscione realized that he (like most chefs) knew next to nothing about why different foods taste good together. That epiphany launched him on a quest to understand the molecular basis of flavor—and it led, in time, to The Flavor Matrix. 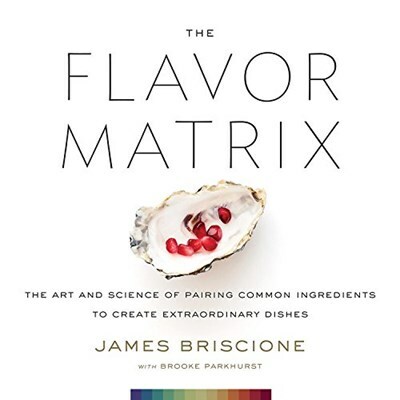 A groundbreaking ingredient-pairing guide, The Flavor Matrix shows how science can unlock unheard-of possibilities for combining foods into astonishingly inventive dishes. Briscione distills chemical analyses of different ingredients into easy-to-use infographics, and presents mind-blowing recipes that he's created with them. The result of intensive research and incredible creativity in the kitchen, The Flavor Matrix is a must-have for home cooks and professional chefs alike: the only flavor-pairing manual anyone will ever need.